The versatile wireless all-in-one printer with superior photo quality. 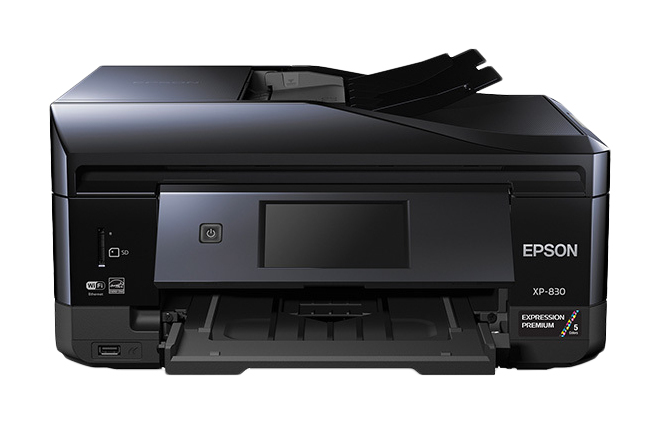 The Expression Premium XP-830 wireless Small-in-One printer delivers superior photo quality and versatility ideal for creative projects. A 30-page Auto Document Feeder and auto 2-sided printing copying scanning and faxing saves time while the auto-extend/retract output tray offers added convenience. Print vivid borderless photos up to 8" x 10" or on specialty paper and DVDs. Easily print from your tablet or smartphone � with or without a router � at home or on the go. Get 4" x 6" photos in as fast as 12 seconds. The intuitive 4.3" touchscreen makes tasks simple. And you can print Facebook� photos coloring books and more with Epson's Creative Print App. - Instantly handle your photos after printing. Prints are smudge fade and water resistant. - Share one printer with multiple computers in your home or office using a wireless or wired network. - Easily copy scan and fax stacks of documents with the built-in automatic document feeder. - Easily print from iPad� iPhone� tablets smartphones and more. - Create � print on specialty paper and DVDs; plus lab-quality borderless photos up to 8" x 10"